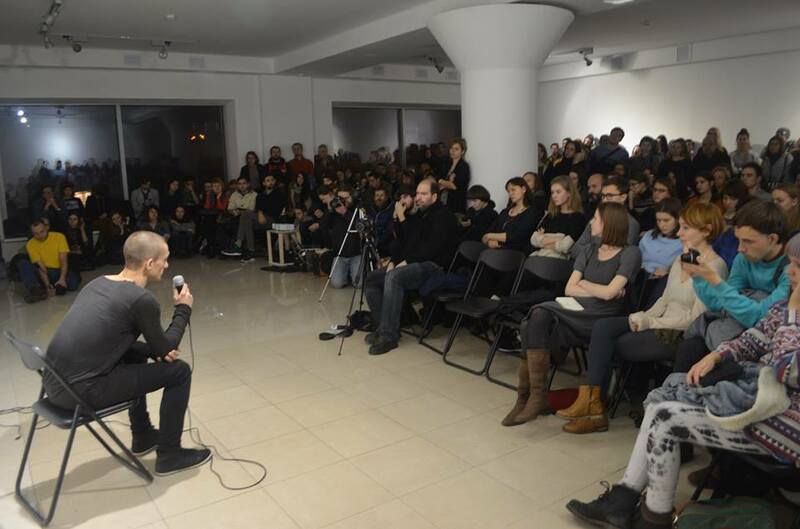 The Visual Culture Research Centre [VCRC] was founded in 2008 as a platform for collaboration between academics, artists and activists at the Ukrainian University of Kyiv-Mohyla Academy. The VCRC emerged out of a desire to abandon the existing disciplinary boundaries between the fields of art, the humanities and politics. Yet, in 2012, the Kyiv-Mohyla Academy’s academic council expelled the VCRC from the university’s premises after the university’s management decided to censor and shut down the Ukrainian Body exhibition for what it deemed to be obscene content. Thereafter, the VCRC went into a phase in which it operated as an independent educational, artistic and political initiative, working on projects at a variety of locations, including the Zhovten Cinema and Ukraine’s National Art Museum. In the tumult of the Euromaidan, the VCRC helped develop the Open University of Maidan project in Kyiv’s central square and ultimately the centre emerged from the events of 2013-2014 with a new home, moving into Kyiv’s 44 Hlybochytska Street in October 2014. To mark the occasion, a Timothy Snyder lecture on Europe post-1914 took place and the new premises have since become one of Kyiv’s key locations for exhibitions and public discussions. As of 2015, the VCRC has organised over 200 debates, research seminars and conferences, created and displayed more than 20 artistic exhibitions and been responsible for a number of public actions. In early 2015, the VCRC subsequently received the European Cultural Foundation’s Princess Margriet Award in recognition of the important work which it carries out in Ukraine. To visit the VCRC’s own website, click here. You can also access the VCRC’s Facebook site by clicking here. Since 2010, the VCRC has worked together with Poland’s Krytyka Polityczna, publishing a Ukrainian version of the Krytyka Polityczna magazine and organising many joint events. To visit the website for the Ukranian version of Krytyka Polityczna, click here. You can also access the Facebook site for the Ukrainian version of Krytyka Polityczna by clicking here.